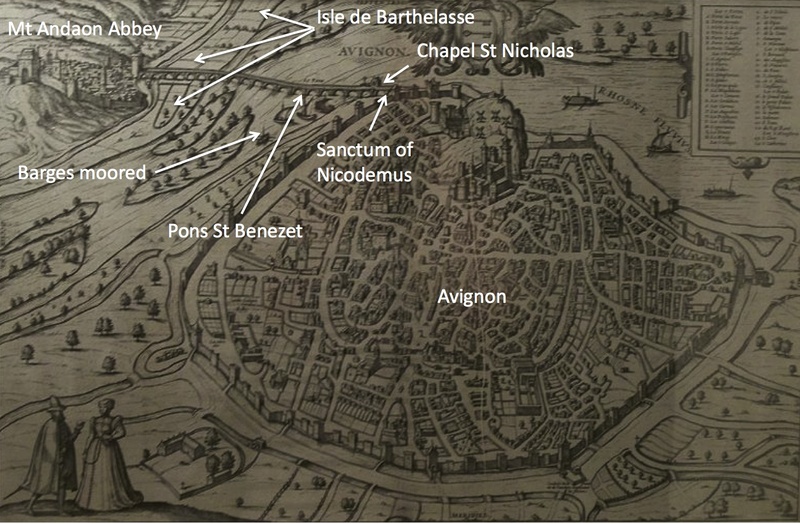 I used the concept map below (based on an anachronistic plan from a couple of centuries later) while working on the main Avignon site of the Coenobium Rhodanien, the former location of the original Jerbiton covenant of Sub Pontem. As you can see, the Hermetic holdings referred to in the text are located to the northwest of the city proper, allow the magi to avoid some of the detrimental effects of the predominant Divine aura while still dominating the major mundane transport links of the river and the bridge. The Isle de Barthelasse, beneath which lie the majority of the laboratories, is pictured above as multiple small islands which shift in size and shape over time, perhaps as a result of magical mishaps within the laboratories beneath.